The National Jewish Population Survey 2000–01 (NJPS) has been the focus of substantial controversy and misinterpretation. Because of both its design and implementation, there are numerous difficulties in using NJPS data to understand the contemporary American Jewish community. This “guide” analyzes key issues about NJPS, including its sampling design, response rale, assessment of Jewish identity, weighting, and structure of the instrument. Although NJPS provides valuable information for scholars and policy users, focusing on population estimates and ignoring methodological limitations makes misinterpretation likely. Estimates, to the extent they are offered, need to be discussed as ranges within confidence intervals and with caveats about their interpretation. A particular caution is that analysis of characteristics of the population must distinguish between the entire estimated Jewish population and those who are “persons of Jewish background.” The present guide outlines appropriate use of the NJPS data set, emphasizing multivariate analyses and investigations of relationships among variables. 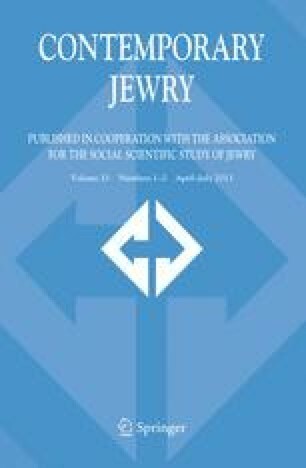 NJPS represents the most complex study of the Jewish population ever conducted, and while methodological limitations need to be taken into account, the study provides potentially important insights into the character of the American Jewish community. The authors’ names appear in alphabetical order. Thanks are due to Samuel Heilman, Mark Rosen and anonymous reviewers for their comments, and Dara Brzoska and Graham Wright for editorial assistance.